Fenris is a new melodic folk black death metal band from Texas, USA that has just released its first work. The band was formed in 2013, motivated by the desire to combine elements of pagan folk music with epic heavy “extreme” metal and bring their music “to all the land and seven seas“. Pretty soon, without any demo, Fenris recorded their debut full-length “Across the Darkened Skies“, which was self released on March 5th, 2014. It is actually the first part of their album that will soon be completed with a second part, entitled “Towards the Northern Star“. Fenris prove themselves quite capable in adding folk metal elements to melodic black death metal, creating a very solid, interesting, catchy and easy to listen album. They have composed very beautiful bombastic songs, combining technical melodic guitars, with epic synths and folk instruments. Their vocals change between passionate brutal screams, epic clean male vocals and epic choirs, all combined in the correct “proportions”. Their orchestrations are very rich and there are times when they sound almost symphonic! And while the band seems to be at a very good technical level, both in instruments and vocals, with wonderful compositions and a very balanced and clear sound, it is their production that still needs work in order to reach at the same high level! I think that their sound needs to be more powerful and natural and less synthetic, especially the drums. 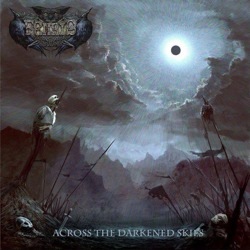 Of course this is just their first effort, so there is plenty of time ahead… ”Across the Darkened Skies” consists of 1o tracks, with a total duration around 37 minutes, including a cover on Blind Guardian’s “Valhalla“. Lyrically the band uses various epic, fantasy and mythological themes and you can read their lyrics in their Bandcamp page. I think Fenris is a very promising band that we will listen more often in the future. If you are into melodic folk death black metal, I recommend you check their debut. Except for the digital version, ”Across the Darkened Skies” is also relf-released in a standard jewel-case CD, with a single page booklet, including the wonderful cover artwork by Nathan James. You can visit the band’s official pages below and listen to the complete album, or contact the band if you are interested in the physical CD.